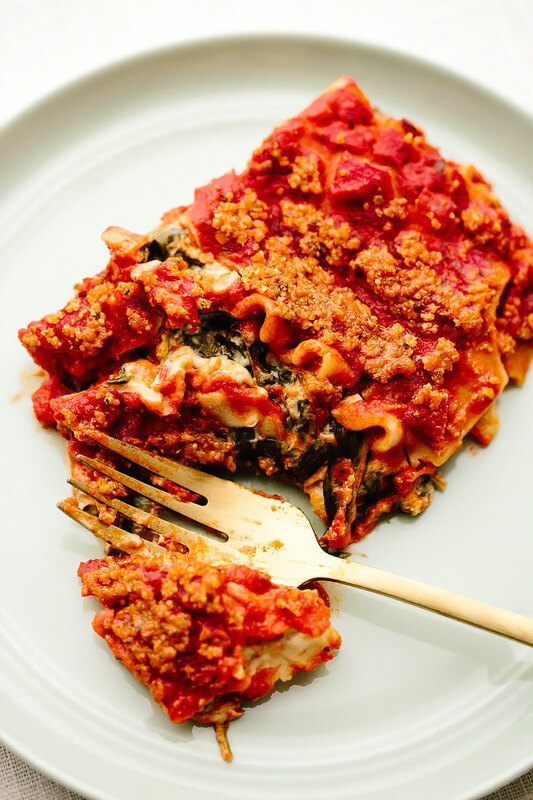 This easy vegan spinach alfredo lasagna is simple to make and a total crowd-pleaser. 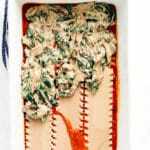 Marinara sauce and creamy spinach cauliflower-cashew alfredo sauce are layered with ribbons of lasagna noodles and baked to perfection. This dish can be made several days ahead of time and reheated as needed for a quick + satisfying meal! This post is sponsored by Earthbound Farm. 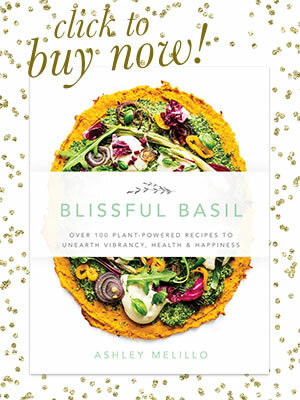 Thank you for supporting the brands that support Blissful Basil! No matter which holidays you celebrate this time of year (if any at all), they’re likely to be outlined by certain well-established traditions. Traditions surrounding food, gatherings, practices, and so on. In our family, we celebrate the holidays at my mom and step dad’s home each year. My mom’s entire family comes over on Christmas day, including her four siblings and their kids (my cousins) and their kids’ kids. Years ago, my mom would prepare each and every dish herself, but as time’s unfolded, she’s taken a more relaxed pot-luck approach to feeding an ever-growing crowd. As the tradition currently stands, she prepares vegetarian lasagna, my grandma prepares meat lasagna, and the aunts, uncles, and cousins bring an array of other dishes, ranging from veggie-laden salads to rolls, cookies, and pies. Since going vegan, I’ve been charged with the task of bringing a crowd-pleasing plant-based main dish each year. Given the Italian/lasagna theme, you’d think a vegan lasagna would have been my trusty go-to right from the get-go, but I’d been intimidated by the idea until now. Most of the vegan lasagna recipes I’ve made in the past have either been incredibly labor intensive (we’re talking 3–4 hours of active kitchen preparation), or they’ve been a little dry and lackluster in the flavor department. So, instead of lasagna, I’d leaned on dishes like lentil loaves, mostaccioli (recipe in my cookbook), or these tasty lentil mushroom walnut balls. All of which are delicious and festive, however, this year I set my sights on creating a dish that would fit in with my family’s lasagna tradition. But there were a few rules I kept in mind as I tested and tasted my way to the very recipe you see here. Transportable and perfect for pot-luck celebrations. 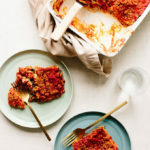 A simple, go-to sort of vegan lasagna that could easily be dressed up and modified to suit a variety of seasons, events, and taste preferences. Nourishing (think: hidden veggies) and satisfying to vegans and non-vegans alike. This lasagna requires a short and simple list of ingredients—just 9 ingredients plus water, salt + pepper—and it’s incredibly tasty. Store-bought marinara (or homemade if you’re feeling fancy) and spinach cauliflower-cashew alfredo sauce are layered with ribbons of lasagna noodles and baked to perfection. 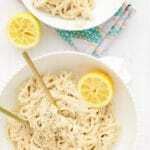 You’ll start by making the cauliflower-cashew alfredo sauce. 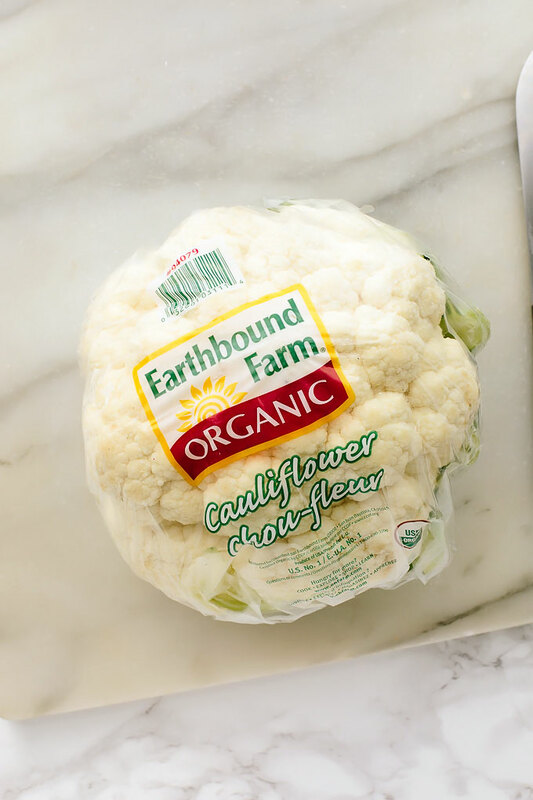 Boil two cups of Earthbound Farm’s Organic Cauliflower (about 1/2 a medium head chopped into small florets) until fork-tender. Then, add the boiled cauliflower to a high-speed blender along with a bit of filtered water, raw cashews, nutritional yeast flakes (add a rich and cheesy flavor reminiscent of parmesan), apple cider vinegar, sea salt, and black pepper. 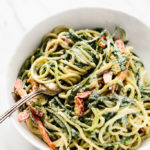 Blend on high for two minutes, or until you have a silky smooth and creamy sauce, and then set the sauce aside while you get to work on the spinach. Add a bit of olive oil and several cloves of minced garlic to a large sauté pan. Turn the heat on low and cook for just a minute, or until the garlic becomes soft and fragrant. 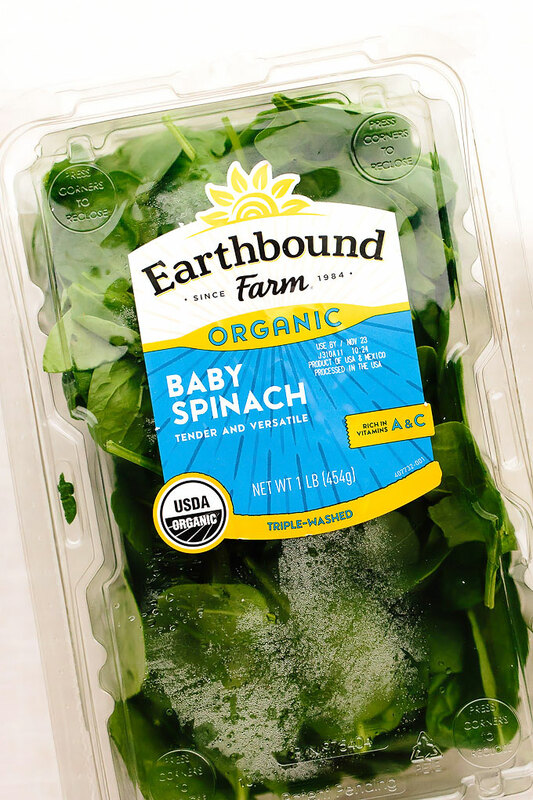 Next, add several handfuls of Earthbound Farm’s Organic Baby Spinach to the pan. Continue to sauté for another three minutes, or until the spinach softens and wilts. Then, stir in the reserved cauliflower-cashew alfredo sauce. Cook for another minute or two, or until the sauce thickens ever so slightly. Now, it’s time to layer. Spread a bit of marinara sauce into the bottom of a lightly greased baking dish. Top with a layer of gluten-free lasagna noodles (or regular if you prefer). Spread about half of the alfredo sauce over the lasagna noodles and top with a bit more marinara. Repeat until you have three full layers of noodles, topping the final layer with marinara only. Cover the lasagna with foil and bake for 30 minutes. Then, remove the foil, sprinkle with a bit of vegan parmesan (optional but recommended), and continue to bake for another 20 minutes, or until the lasagna is hot and bubbly. Remove the lasagna from the oven and let it rest for about 5 to 10 minutes. Then, slice and serve. 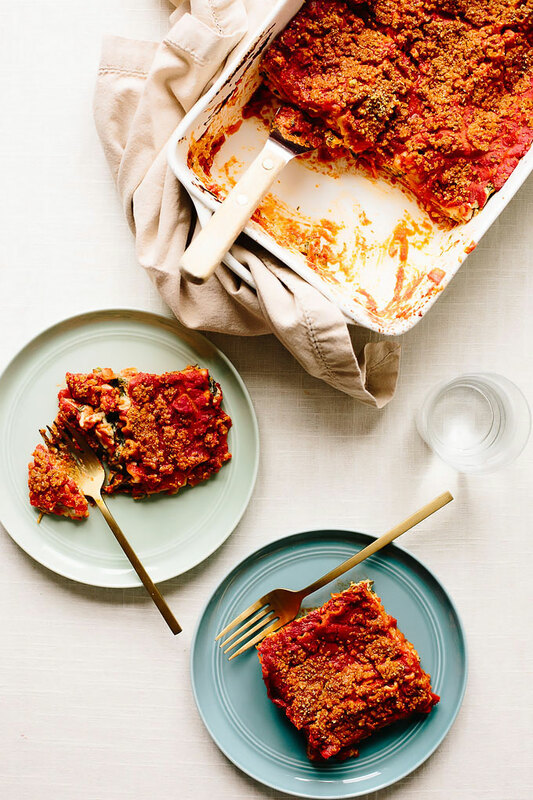 This vegan lasagna can be made ahead of time and reheated as needed for quick meals throughout the week. For a pot-luck, I recommend preparing and assembling the lasagna ahead of time and simply baking upon arrival. What I love most about this vegan lasagna is that it’s easy to adapt to individual taste preferences. For instance, if you’re looking for a veggie-packed vegan lasagna, simply add sautéed vegetables on top of the alfredo layers. I recommend a combination of sautéed mushrooms, zucchini, red peppers, and yellow squash. 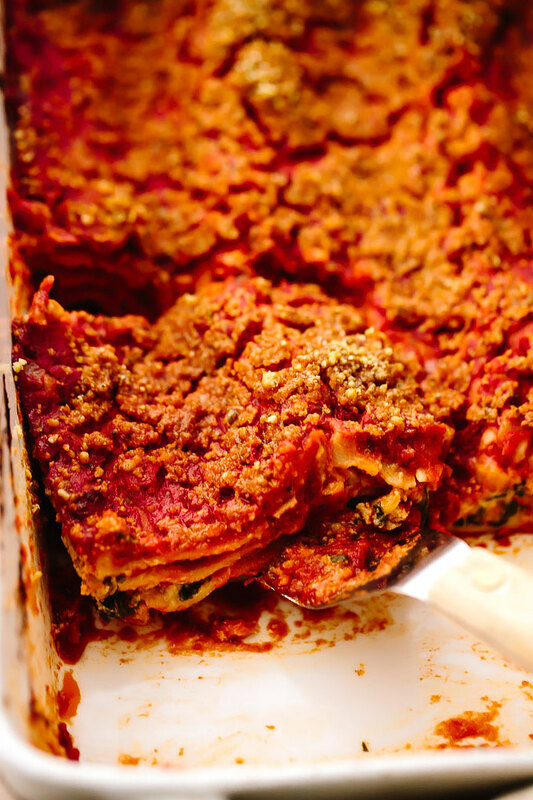 I hope this lasagna recipe brings both simplicity and joy to your holiday gatherings. Preheat the oven to 350F. Lightly grease an 8" x 11" baking dish with olive oil. Bring a medium pot of water to a boil. Add the cauliflower florets to the pot and boil for 7 minutes, or until very fork-tender. Strain off the water. Add the boiled cauliflower florets, filtered water, cashews, nutritional yeast, vinegar, sea salt, and black pepper to a blender (do not use a food processor). Blend on high for 2 minutes, or until completely smooth and creamy. Set within reach of the stove. Heat the olive oil and garlic in a large sauté pan over low heat. Cook for 1 minute, or until the garlic becomes soft and fragrant. Add the spinach and cook for 3 minutes, or until it begins to wilt. Stir in the cauliflower sauce. Continue to cook for another minute or two, or until the sauce thickens ever so slightly. Turn off the heat. Spread about one-quarter of the marinara into the bottom of the prepared baking dish. Add a layer of lasagna noodles. 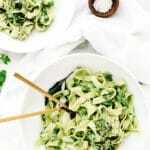 Cover the noodles with about half of the spinach alfredo sauce. Top with another one-quarter of the marinara sauce. 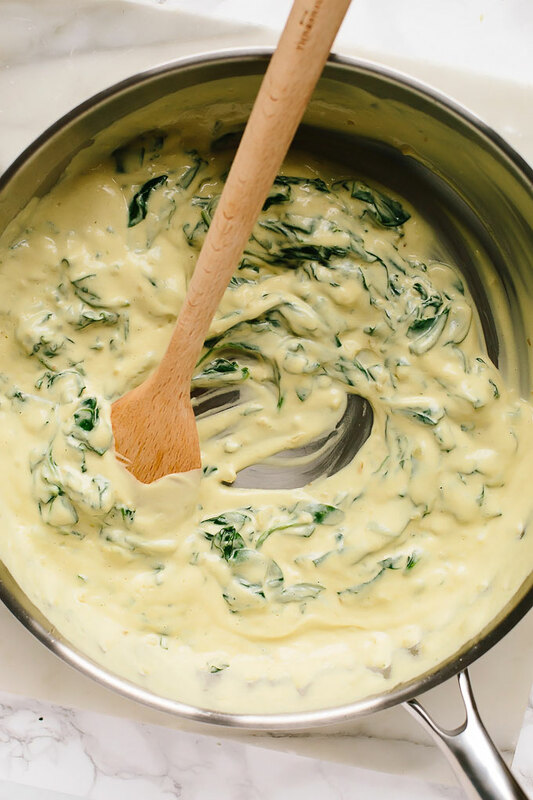 Add another layer of lasagna noodles and cover them with the remaining spinach alfredo sauce. Top with another one-quarter of the marinara sauce. Finally, top with the last layer of lasagna noodles and cover with the remaining marinara sauce. Cover the lasagna with foil and bake for 30 minutes. Then, remove the foil and sprinkle with as much of the vegan parmesan (if using) as desired and continue to bake for another 20 minutes. Leftovers can be refrigerated for up to 5 days or frozen for up to 1 month. *The amount of salt you use in the Alfredo should depend on 1) your own taste preferences, and 2) the salt content in the marinara you purchase. The marinara I typically use is fairly well-seasoned, so I find that 1 teaspoon of sea salt is plenty. However, for a less seasoned marinara, I'd recommend using 1 1/2 teaspoons and for a thoroughly seasoned marinara, I'd recommend starting with 3/4 teaspoon and working up from there. 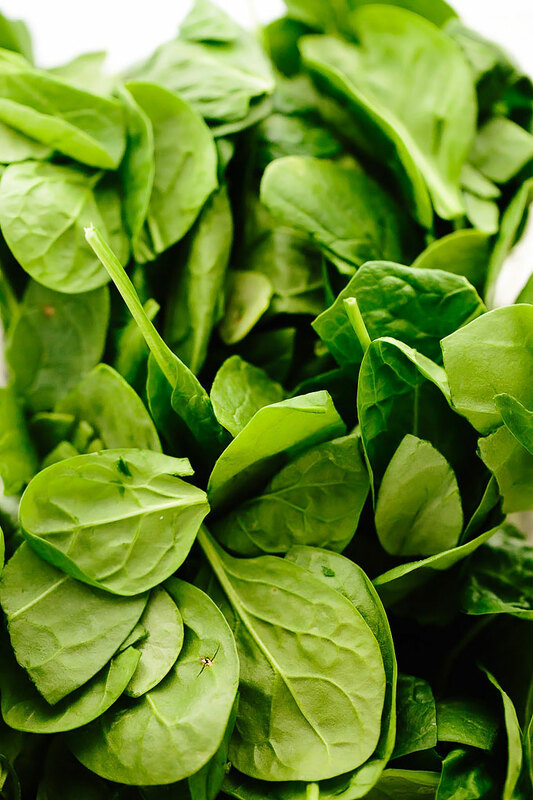 **Feel free to double the amount of spinach (i.e., 10 ounces). Five ounces is simply the bare minimum I recommend using. ***To keep things simple, I recommend using a brand of lasagna noodles that doesn't require pre-boiling (e.g., Tinkyada). ****Feel free to get creative with this recipe. 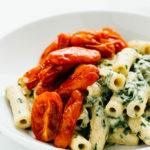 As written, the recipe serves as a wonderful base for more creative veggie combinations. Sautéed zucchini, mushrooms, red peppers, and yellow squash make wonderful additions—simply add them on top of the Alfredo sauce layers. 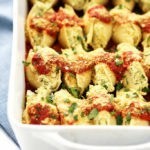 Cauliflower Ricotta Stuffed Shells from Nom Yourself: Simple Vegan Cooking + A Cookbook Giveaway! Looks all sorts of YUM!!!!!! Great way to wedge more spinach in your meals! This lasagna looks absolutely perfect, Ashley! 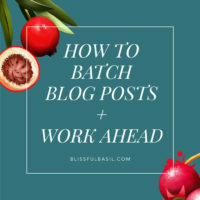 But that shot of the spinach that you snapped…. I would make that into a poster and hang that up in my kitchen!! So pretty!! Recipe looks delicious – can’t wait to try it. Do you boil the lasagna noodles before layering? Thanks, Barbara! I’ll add a note to the recipe but you should prepare the lasagna noodles according to package instructions. The brand I use (and most gluten-free varieties) don’t require pre-boiling the noodles, in which case you can just layer them in dry. Enjoy! Made this tonight for dinner. Absolutely AMAZING. Thank you for being so thoughtful with your attention to detail in your recipes. I know that when I make a Blissful Basil recipe, it will turn out on point & tonight was no exception. The cauliflower sauce is phenomenal. As always, thank you! 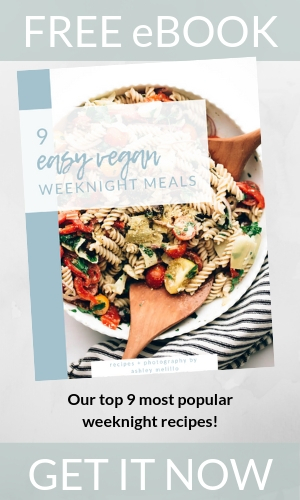 I have been so underwhelmed by vegan recipes lately, but not by this one! It’s rich and delicious! I made the mistake of using Barilla lasagne noodles so I had to precook them, but if not it would have taken much less time. So, so, so good. My husband and 14year-old son are digging in as I type! Wow. We just had this for dinner and it was AMAZING. 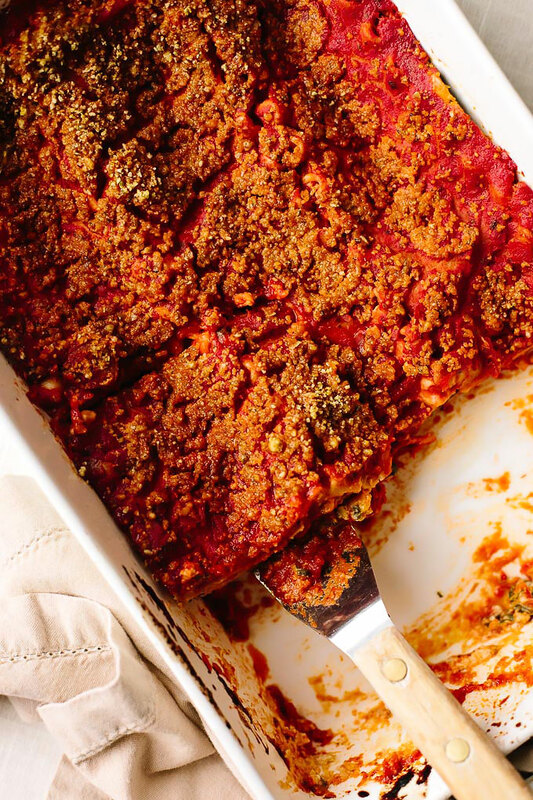 I thought I had found my favorite vegan lasagna but this is so much better. I made mine with sauteed mushrooms and doubled the spinach. I’m already brain storming additional uses for the cauliflower Alfredo sauce. YUM! Thank you for such innovative recipes, Ashley! Thrilled to hear you enjoyed it so much, Shari! 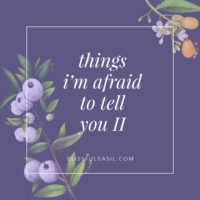 Thanks for taking time out of your day to come back and share your thoughts and adjustments—means so much to me and is helpful for others, too! My dad and I both switched to a plant-based diet earlier this year, and he has been asking me for a good lasagna recipe for a couple of months. I’ve tried a few and wasn’t a huge fan, and then last night we made your recipe and we both absolutely loved it! We added some zucchini, red pepper, and mushrooms but otherwise followed the recipe exactly, and it turned out perfectly. 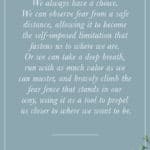 This will definitely be a go-to recipe for me moving forward. Thanks so much! I was wondering if there is a substitute for cashews? My daughter is allergic. Hi, Nicole! You can substitute shelled hemp seeds, but keep in mind it will have an earthier flavor with this swap. Enjoy! Glad you’re enjoying the recipe, Amelia! Thanks for taking time out of your day to come back and share your thoughts—means so much. This recipe is fabulous! My husband and I have made it several times now, we usually add mushrooms and olives for extra veggies. We brought it as a dish to a gathering so we had food. Everyone asked for leftovers and the recipe! Thank you so much Ashley! Love this recipe! I love it so much that I’m making two to take on a family trip this weekend. If I’m preparing a couple days in advance, should I keep it in the refrigerator or freezer before baking? Thanks! Hi, Carrie! So glad you’re enjoying the recipe. I’d keep it in the refrigerator if preparing just a couple days in advance. Have a beautiful weekend!